“How do I get my students to see the connection between the classroom and the world? 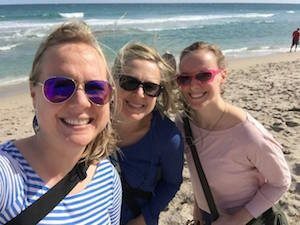 How do I get them excited about their own ability to make a difference?” Two years ago, these questions were posed to me by a friend interested in finding a deeper way to combine her passions for teaching and the mission of the Ugandan Water Project. The questions didn’t surprise me; I’ve asked them of myself during years in the classroom. 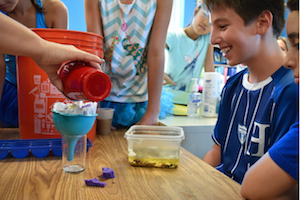 As standards push for service-based learning – integrating meaningful community service, experiential instruction, and reflection to enhance learning – it’s a growing challenge for the education community. In a unique way, these questions have driven us here at UWP to find answers. My own involvement in the solution has been part of a journey. Great challenges are rarely solved quickly. Instead, they provide an opportunity to look at the past to see an eclectic array of experiences and paths that have been woven together to bring you to the present reality. For me, this opportunity hit me while sitting in a small AirBnB kitchen in southern Florida – side tables rearranged to make workspace, random chairs pulled in from the bedrooms. 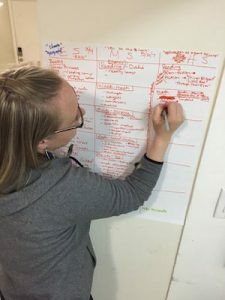 Weeks ago, I huddled around cups of coffee and hashed out the nitty-gritty details of what was once a dream: a curriculum combining content, standards, and hands-on learning for students that helps students become change-makers. Along with the incredible talent, passion, and expertise of my colleagues Lizza Irvine and Jessica LaLiberte, our team spent long hours with sticky notes, markers, and computers to refine and create a program that will empower teachers, inspire students, and bring clean water to Uganda. We began building on the foundation of the Day of Water: an interactive experience for students to connect the real-world water crisis in Uganda with major content areas – science, reading, English, social studies, and math. With a broad approach, students can see both the importance of the individual classroom content and the connections to a single problem… a single problem they can solve. There is a certain buzz when the right people are in the room. My cohorts for the weekend were two talented women. 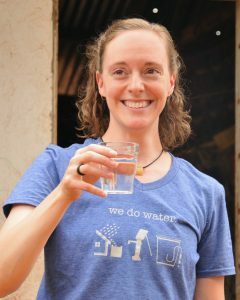 Lizza Irvine, a Music Teacher at the McDonogh School in Maryland, has long been a supporter and advocate for the Ugandan Water Project, traveling to Uganda on several teams, and bringing UWP into her classroom where her students have funded multiple water projects over the years. 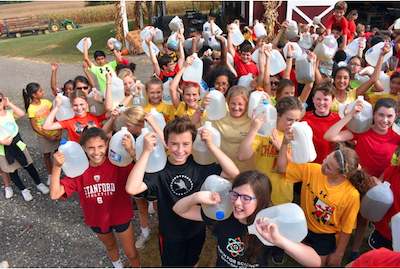 The inspiration for this weekend came out of Lizza’s desire to increase the depth of understanding and impact that her students could have on the global water crisis. For several years now, McDonogh students have walked through a Day of Water. Her students engage in hands-on activities surrounding the water crisis, the work of UWP, and how they can be champions to bring solutions and change. Also at the table is Jessica LaLiberte, a Language & Literature Instructor at Saint Andrew’s School in Florida. Jess’s passion is in curriculum design, and her expertise on best practices in education led her to pursue connecting with the Ugandan Water Project after UWP partnered with Saint Andrew’s students in a Day of Water event last May. I reflected on my own path to that kitchen. An undergraduate degree in Communication that didn’t lead to a career after graduation. Years spent teaching middle and high school students in my church. An internship in non-profit special events coordination. A Masters Degree in Education and 5 years in classrooms hoping to bring lessons to life. A trip to Uganda that changed my career path. And all along the way, meeting people and building relationships that would prepare me to be a part of this creative endeavor. The collision of each of these threads is a weaving together: using my strengths and skills as a teacher and communicator, as a representative of the Ugandan Water Project to create. already being taught, helping meet educational goals and building in natural service-learning components. Truth be told, it was a flurry of ideas and energy! Between the three of us, what was cooked up in the kitchen began to bake and rise. 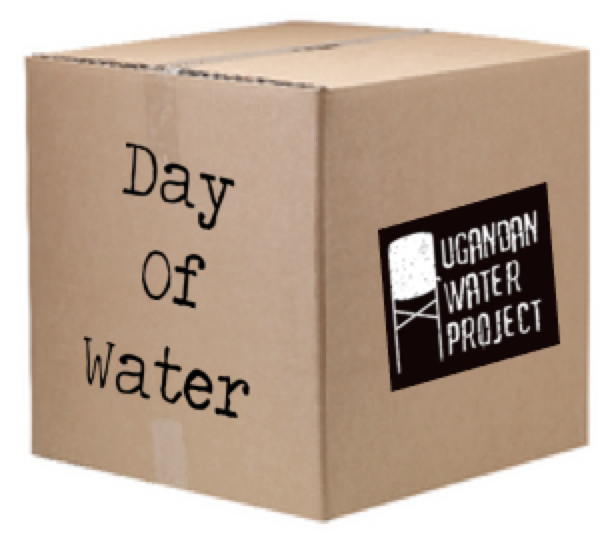 UWP wants to provide this new Day of Water and extended lessons as a facilitated collaboration between schools, students and UWP as well as providing portable curriculum – options that will give flexibility for teachers and expand the reach of UWP to schools beyond our immediate geographic area… a Day of Water in a box, so to speak. What excites me most is the tapestry that has been created from the threads of all three of our lives. A team was formed, a new bond of friendship and shared experience with a passion toward a shared goal. 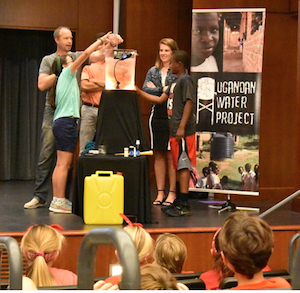 Now, the Ugandan Water Project is moving forward to be able to truly equip and resource teachers and schools with powerful lessons, and to call out the potential in students to be change-makers in the world right now. 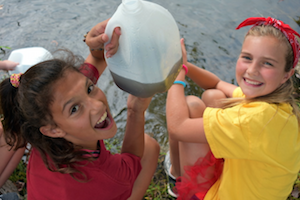 Wouldn’t you like your school to host a Day of Water and see your students engage in a meaningful learning experience? Start here!